Perhaps one of the largest obstacles to understanding what life was like in Bible times is the difference between a modern city and an ancient city. A modern city spans hundreds of square miles, but an ancient city was typically only a few acres. A modern city has no protection around it, but an ancient city was protected by a massive wall. A modern city has dozens of roads leading in and out of it, but an ancient city had (at most) a handful of gates leading in and out, and often had only one. So when a modern reader opens the Bible and reads about Boaz doing business transactions at the city gate (Ruth 4) or gossipers sitting in the gate (Psalm 69:12) or Amos calling for justice in the gate (Amos 5:15), the full significance of those passages may be lost. 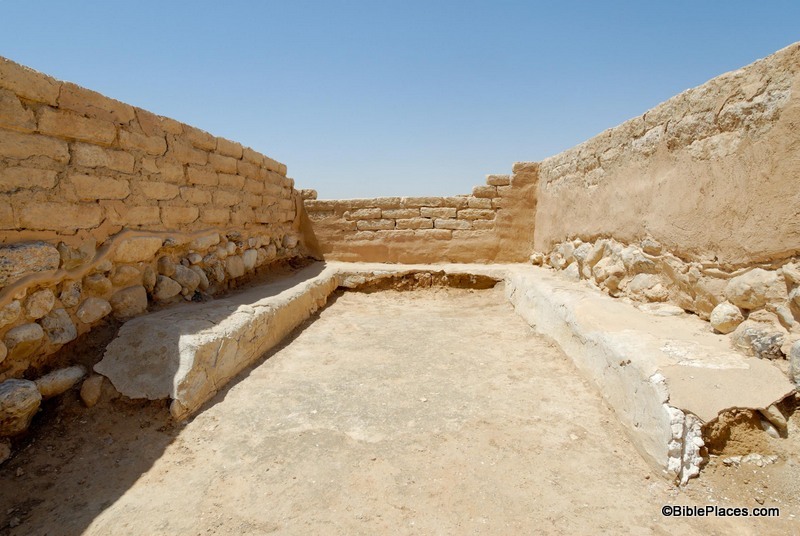 Our picture of the week comes from Volume 5 of the Pictorial Library of Bible Lands, and shows the remains of the Iron Age gate at Beersheba. Actually it shows only one chamber within that gate. During this time period, it was common for gates to have rooms on either side of the passageway. For example, a double chambered gate had two rooms on one side of the passage and two on the other side. It was shaped like an E and a 3 facing each other: E3. These chambers sometimes were lined with benches, such as in the picture below. This would provide a place for people to sit while carrying out the various types of business that happened in the city gate ... and there was a wide variety of action here. Since there was always a small number of gates in an ancient city, all the foot traffic coming in and out of the city was funneled though this one place. Consequently it became an ideal place for people to sit and do business transactions, talk about current events, or sell their wares. It also was a convenient place for the elders and rulers to decide legal matters or prophets to proclaim a message from the Lord. In times of battle, these rooms provided the soldiers of the city with space to fight an enemy that had managed to break through the door. When discussing the gate, one should realize that this was more than just a door; it was a gate system. Many cities, such as Hazor, Megiddo, Gezer, Lachish, and Dan, had a series of gates, outer and inner, through which traffic found its way in and out of the city. … The main gate was a formidable structure that had two or more stories to provide space for the activities undertaken by the civic and military administrations and by the citizenry. … The street-level floor had one to three chambers on each side …. The gate area, including the chambers and the open space around it, was used in peacetime for judicial, commercial, and social activities. The city elders, as well as the king or the regional governor, met in the gate to hold court. At Tell Dan, the remains of a low podium for an elaborate seat and canopy were found by the gate adjacent to the open area. The chambers in the gate at Gezer contained low benches along the walls to provide seating, possibly for the elders or for merchants. The gate was also where certain cultic activities took place (2 Kgs 23:8), as illustrated by the standing stones discovered at Dan and other sites. In the age of computers, automobiles, and sprawling cities, there really is no good modern equivalent of the city gate. It was the mall, the courthouse, the army base, the television, and Facebook all rolled into one. In many ways, it was the center of daily life in the city. Excerpt from Oded Borowski, Daily Life in Biblical Times, Society of Biblical Literature: Archaeology and Biblical Studies, No. 5 (Atlanta: Society of Biblical Literature, 2003), pp. 47-48. This photo and over 700 others are available in Volume 5 of the Pictorial Library of Bible Lands, and is available here for $34 with free shipping. Additional pictures of ancient gates can be seen here, here, and here on the BiblePlaces website. Hello, I read this, very interesting. While you are essentially correct about the layouts of ancient cities, you must understand that there are exceptions. Modern architects and urban planners boast about sprawling mega cities but consider this: A city such as Manhattan, New York, if you go by the island of Manhattan, is tiny in comparison to ancient mega cities like Babylon. The ancient historian Herodotus said the walls of Babylon were 56 miles in length, 80 feet thick, and 320 feet high. The Babylonians were able to ride horses and chariots along the tops of their walls. Would you call that some small 'dinky' little place? I think not! Modern people tend to be on the arrogant side when it comes to achievements. Ancient people even had stain-resistant steel in the form of wootz "Damascus steel" imported from India and the Chinese had very quality steel. Romans even had a stain resistant carbon steel imported from Noricum Australia and Spain.